Craving hot, authentic pizza in the 89118 area? Come grab a slice of the good stuff at Pop Up Pizza. Located inside the Plaza Hotel, we offer the best Fremont Street food straight from our oven to your taste buds. Whether you’re an avid fan of the classics or looking to try a gourmet culinary creation, you’re sure to find something you like on our menu. At Pop Up Pizza, we combine the classic tradition of great pizza with modern flair. From our unique, creative menu to our original decor, a dining experience at our pizzeria is one you won’t soon forget. Did we mention that we our vegan friendly and our pizzas are gluten free? 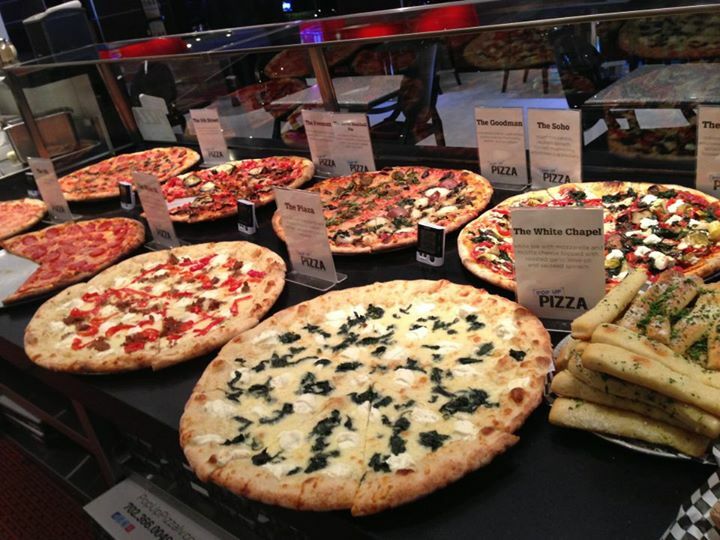 There’s something for everyone to enjoy, so bring some friends in for a slice. Pop Up Pizza is now delivering mouthwatering pies from our oven to your doorstep. We also offer late night pizza delivery in Las Vegas for those midnight cravings. As an added bonus, when you buy 9 slices of pizza, you get the 10th one on the house! Our hand crafted pizzas are out of this world. But don’t take our word for it – try a slice for yourself! Call us at (702) 366-0049 to order and ask about our current specials.